Considering Per Nørgård the most prominent Danish composer after Carl Nielsen is hardly a matter of hype. The principal witness to this is his overwhelming musical oeuvre, a music of such originality and profundity of thought that it is unparalleled in new Nordic music. With his work distributed evenly throughout a wealth of musical genres, from symphonies, operas and chamber music to film and theatre music, Per Nørgård's production is a highly personal travel document based on his endless incursions and excursions through the sonic labyrinths of this world. A world which to Nørgård is not just a confusing conglomeration of events, of chaos and irradicable suffering, but also an enchanted place, full of things to discover if you keep your mind and your senses wide open: the unending variety in nature, the endless connections between things, and not least the infinitely complex universe represented by any sound, no matter how modest. When the 17 year old Nørgård became the pupil of our great and original symphonist, Vagn Holmboe, it was the force of destiny. For Holmboe's concept of 'metamorphosis', the idea of a musical embryo in continuous organic transformation, was made to measure for Nørgård's temperament. 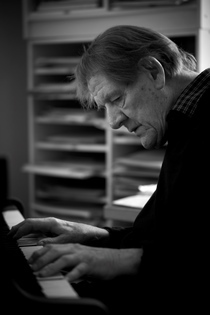 The musical ideas which he was later to keep circling around seem present in an embryonic state in his milestone work Constellations for 12 solo strings (1958), but it was not until ten years later that Nørgård's so-called 'infinity series' clearly unfolded with Voyage Into The Golden Screen (1968) for chamber orchestra. Technically, it is a principle of growth where new intervals are created ad infinitum. As in nature, the principle is infinitely simple but the results are infinitely complex. Exploring the many aspects of this unlimited universe kept him busy for a number of years, culminating in the huge 3rd Symphony (1974). Subsequently Nørgård encountered the work of Swiss artist and schizophrenic Adolf Wölfli, which made irrationality, conflict and instability re-surface in Nørgård's music - not in the form of fragmentation or ambiguity as had permeated much of his work in the previous decade, but as the inevitable counterpart to universal order. This is clear even from the title of the 4th Symphony (1981), 'Indian Rose Garden and Chinese Witch Sea'. And it resonates through the opera The Divine Circus (1982), portraying art as a soap-bubble bursting between truth and delusion. But while the old representations of harmony, growth and ripening are disappearing, new ones keep materialising, and his recent works are more intimate, open and vulnerable than ever. Nørgård’s string-concertos from the eighties pursue even more intensely the least tangible musical fundament: time. In the viola concerto, Remembering Child (l986) and in the violin concerto Helle Nacht (1988), Nørgård continues his exploration of the stratification of time in a kind of tempo-scanning of the melodies where accentuation, metre, and beat constantly reveal new melodies within melodies.